Biting into a sweet, juicy cherry tomato on a summers day is hard to beat! They taste so much better fresh, and they should be eaten warm - when the aromatics in them are at their most active, to give the best flavour. Growing tomatoes is easy and incredibly rewarding - make salads and chutneys, or of course eat them fresh. 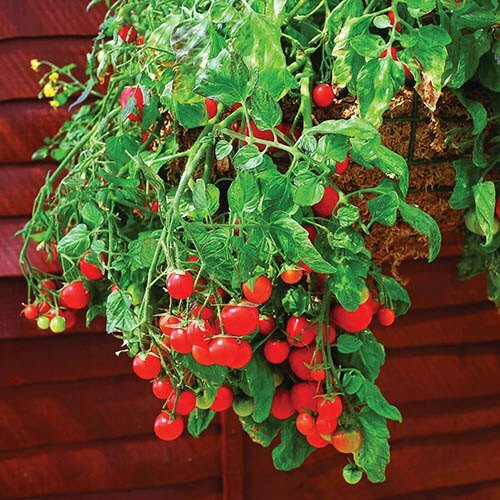 'Tumbling Tom' is the ideal variety to get started growing your own tomatoes - so easy in hanging baskets, tubs, planters and even wondowboxes, you will gets hundreds, even thousands of small cherry tomatoes in Summer. Get the children growing them! They are self-branching, so other than pinching the tip out when you plant, there is no need to do anything else to them, unlike other tomato varieties.